In this pioneering work the author has set forth a new method for addressing the crucial problem of defining what constitutes a sculptural style in the Indian context. 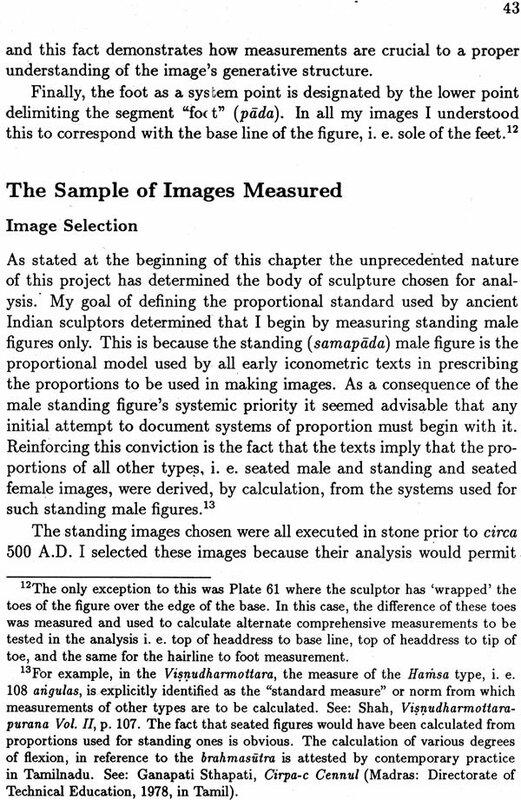 His thesis is that we must carefully look at the way the Indian sculptor worked if we want to construct a method of analysis that will permit us to meaningfully analyze the artist's forms. When we consider how the Indian sculptor works we find that he learns and articulates his forms through the use of measure: the curves of his lines and the swells of his volumes are visually learned and recreated in relation to a fixed device or constructive system consisting of lines and points. 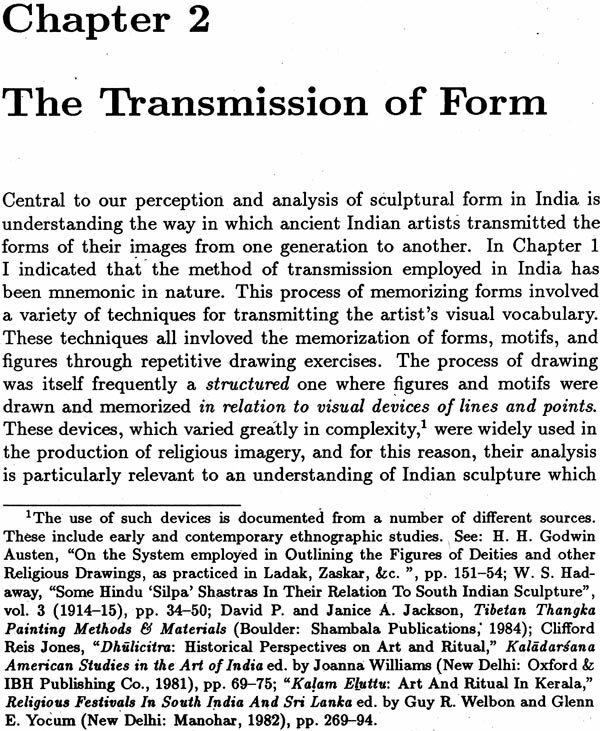 Thus, the author defines here a new approach to the study of Indian sculptures based upon the measure of their forms which will permit the definition of the temporal and spatial parameters of a given style and, at the same moment, establish the true range of its variation. In Chapter I the author presents the evidence of how sculptural forms are transmitted by artists in India both now and in the ancient past. 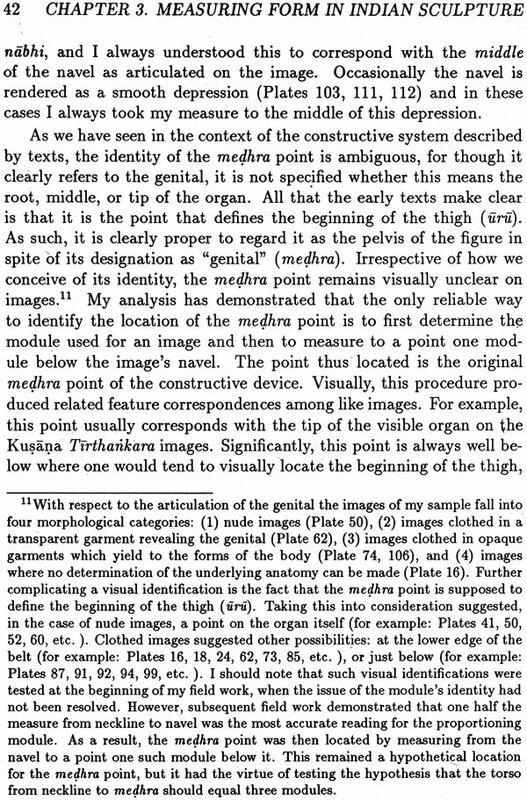 In Chapter II he indicates how the underlying structure of these forms the constructional device used to create them can be revealed through an analysis of measurements taken from images because this device was consistently articulated in terms of a proportional system. 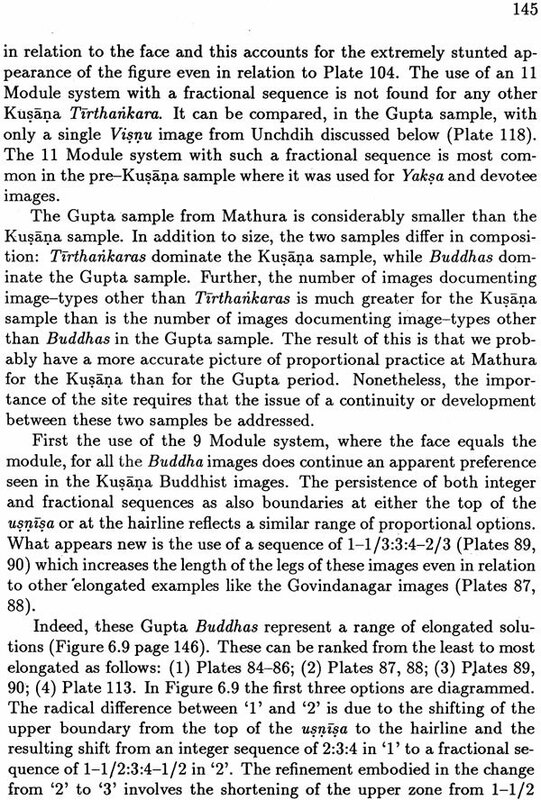 In Chapters III, IV, and V the author presents a new and significant body of proportional evidence based upon the analysis of one hundred and ten early Indian images that demonstrates both the validity of a quantitative approach as also the scope of the new information it yields. 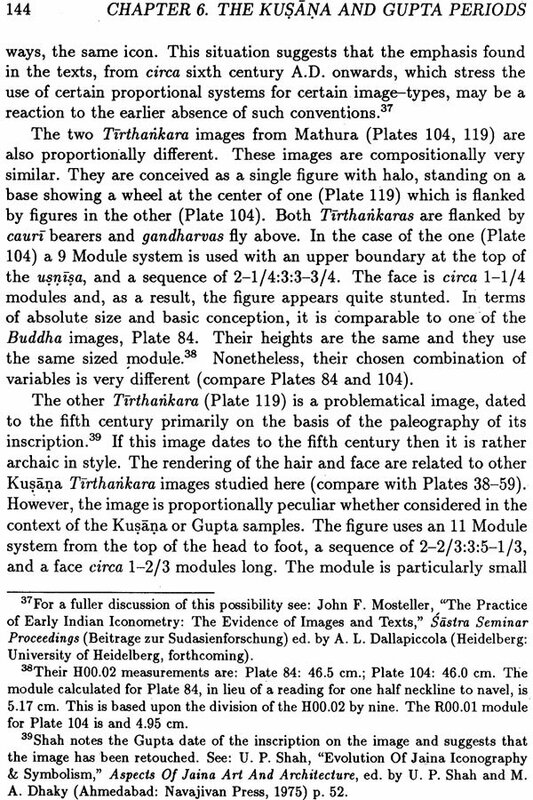 Finally, in his conclusion, he indicates the potential this new approach has for deepening the study of Indian sculpture by permitting a precise analysis of the changing morphology of Indian images which directly parallels the artist's own understanding of his forms. All of this will be realized, as the author points out, when the method he has developed and presents here is combined with the new computer technology of imaging systems which can digitally capture visual objects so that their total measure is automatically recorded. Thus, in this book, the author shows not only how the application of his method will revitalize the study of Indian sculpture as we move into the twenty-first century, but also demonstrates the pioneering role Indian art will play in what will be a new imaging-based approach to the analysis of all visual art. In India measure or the act of measuring has played a significant role in defining what constitutes the creative process both conceptually, at the level of speculative thought and myth, and practically, at the level of ritual and artistic activity. Fundamental to Indian cosmological conceptions has been the maxim that to measure is to create. This world, defined as name and form (namarupa) was created from a formless ocean or void and measure was integral to its creation: while the formless ocean was without measure the created world was defined by it. This same idea is also expressed mythically as early as the Rigveda where a hymn extols Visnu as the one who, in three strides, measures out and hence brings into being the universe.' In the context of ritual, the creative efficacy of measure was integral to the regimen of the Vedic sacrifice (yajna). Measure gave form to the sacrifice just as it gave form to the universe: it defined the ritual arena, the location, form, and proportions of the altar, the meter of the chant, etc. With the rise of bhakti and the development of image oriented piija, measure continued to define ritual and, by extension, the objects of that ritual. The image-maker, irrespective of his medium, controlled the realization of his forms through proportionate measure, while the architect created both the plan and elevation of the temple articulating its faceted surface through the same use of proportionate measure. At each of these levels measure functioned as either a key symbol or tool and, at times, as both simultaneously. In speculative thought the primitive insight into the generative power of measure, obvious at the level of everyday experience, became a prime symbol or model for divine creation. In Vedic ritual, because the sacrifice was a symbolic representation of the cosmos, measure functioned as both symbol and tool: it was at the same time a ritual imbued with magical power and a technical process defining concrete form. This dual function of measure in the ritual of the sacrifice later found expression in the visual arts where the requirements of craft and religion also merged. Therefore, just as form could not be created without measure, and beauty could not be achieved without proportion, so gross matter could not be sanctified without its ritual demarcation. 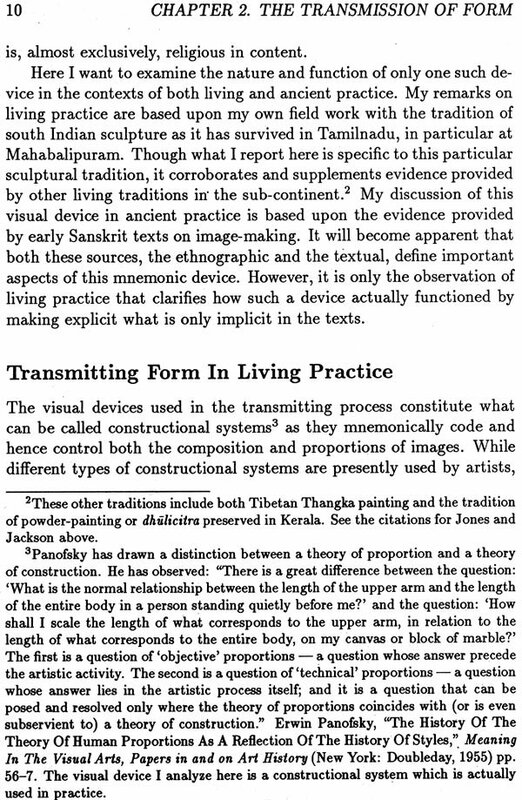 This primal ritual of sanctifying form through the definition of its measure became a fundamental part of the techniques used by the Indian artist in the creation of both images and temples. Though the obvious significance of measure in. the articulation of Indian culture has not gone unnoticed, the degree of its importance in both the formation of Indian art and our analysis of this art has yet to be fully appreciated. The reasons for this lack of appreciation are varied but principal among them is the way measure has been traditionally studied by historians of Indian art. Scholars have traditionally viewed the study of measure, whether in the context of figural art or building, as a strictly technical topic." Earlier writers, understanding measure as only the application of a system of proportion, focused almost exclusively on the elucidation of the proportional systems prescribed in ancient texts. This emphasis on texts, as the primary sources for the study of measure or proportion, has had two important results. First, it has served to perpetuate, in the Indian context, the theoretical bias of Western studies on proportion and, as a result, has led to an almost total lack of interest in the proportional data embodied by the surviving ancient monuments." Second, this singular reliance on texts has led us to believe that the use of proportional systems in images was only a technical concern of the artist. As a result, the belief persists that the use of these systems was peripheral to the artist's goals and achievements and, therefore, of little importance to his or our understanding of his style." Nothing, however, could be further from the truth. In ancient India, the arts of painting, sculpture, and architecture utilized a shared approach to the articulation of form in which measure played a central role; This approach involved a distinction, made on the part of the artists, between measure and proportion. Because my concern here is with sculpture I examine this distinction with reference to the approach of the traditional Indian sculptor which I have documented through field observation, textual analysis, and a quantitative analysis of ancient images. In the approach of the traditional Indian sculptor measure and proportion function as integral parts of a mnemonically coded system for transmitting artistic forms over time. This system was and is a constructive one relying on the use of visual devices consisting of drawn lines and points." The initial delineation of such devices is the first step of a learned procedure or technique of execution which encompasses both the two dimensional design of images and the translation of their forms into three dimensional carvings. Fundamental to the device's function is the fact that it acts as a visual guide to the memory of the artist: the lines and points of the device visually code the proportion, structure, and composition of the image's forms. A proportional system (talamana) determines the subdivision of both the vertical and horizontal lines that can make up the device, These points of subdivision encode the proportions of a figure because they identify the location of a specific series of features on the image. Furthermore, the outline of an image and the delineation of its details are then positioned in relation to this fixed construct. It is in this process of drawing the image that the distinction between proportion and measure is relevant. The proportioned device is used by the artist to measure his line: the memory of its beginning, end, and intervening curve are always controlled by the constructive device as the artist seeks to duplicate the form of his image as he has memorized it. The translation of this drawing into a fully carved image is governed by the same mnemonic process: the artist memorizes the volumes of his forms and their dynamic relationships to one another in conjunction with a working technique that facilitates their realization.